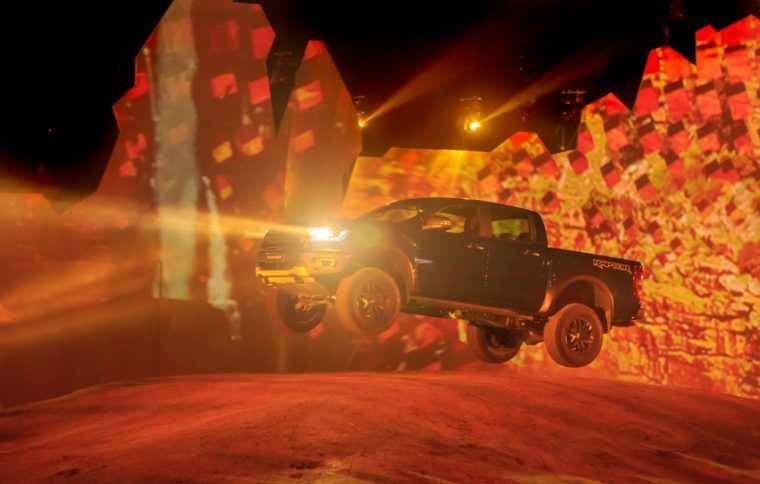 Though it was not suggested when Ford revealed the 2019 Ranger in Detroit, and despite it not being confirmed at the time of its world premiere in February, one almost has to conclude that the Ford Ranger Raptor will, come hell or high water, find its way to America. If you’re among those holding out hope that Ford will make the only logical move available on the chess board, take comfort in the fact that a left-hand-drive Ranger Raptor has been spotted testing in the wild. Note two things in the video above, captured by the eagle eyes at Car and Driver: the Michigan manufacturer plates and the looming shadow of a McDonald’s, the most American of all institutions. This information — most especially the McDonald’s thing — is almost certainly confirmation that the Ranger Raptor is on its way to the United States. The left-hand-drive Ranger Raptor looks largely unchanged from its right-hand-drive counterpart. Car and Driver suggests that Ford will equip the performance truck with a version of the 2.7-liter twin-turbo EcoBoost V6 found in the Ford F-150 and upcoming 2019 Ford Edge ST. The Asia Pacific-spec’d Ranger Raptor is offered with a twin-turbo 2.0-liter diesel, which is unlikely to make the leap stateside. Car and Driver estimates that the Ranger Raptor will appear for the 2021 model year and carry a starting price of at least $45,000. Ford last month revealed a number of updates for the 2019 Ford F-150 Raptor, including new electronically controlled FOX shocks with Live Valve technology and Trail Control for improved stability when off-roading.